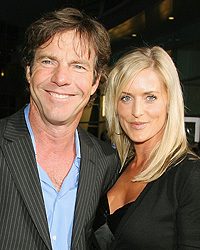 Cedars-Sinai Medical Center has announced a series of changes made after Dennis Quaid’s newborn twins received a potentially fatal accidental drug overdose, and now Quaid’s lawyer is speaking out about the lawsuit he has filed against the pharmaceutical group Baxter. Quaid’s attorney Susan Loggans made it clear that Quaid is not seeking monetary gain, but what they want to do “is make the public aware that medication errors are a national epidemic.” Also, Loggans hopes that this lawsuit will be an example for others. The hospital announced sweeping changes yesterday after the incident, where newborns Zoe Grace and Thomas Boone were given an accidental overdose of the anti-coagulant heparin. Medical staff must now rigorously check doses of all medication, and the individuals involved were relieved of duty pending an investigation. “Although this was a rare event, and attributable to human error, it is also an important opportunity for the entire institution to explore any and all ways we can further improve medication safety,” said Michael L. Langberg, M.D., chief medical officer at Cedars-Sinai Medical Center. The hospital also revealed just how the Nov. 19 scare unfolded, admitting that a pharmacy technician failed to have another technician verify the concentration of heparin. Because of the oversight, the twins received an adult dose 1,000 times the normal limit for babies.